It was an early morning to get to Patan on time for my presentation. 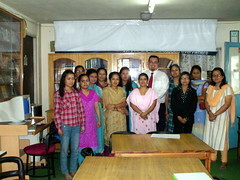 The Women in ICT technology class run from 6-8 am; my office day here usually starts at 10am. We picked up Nina-ji, the Co-ordinator at FTG Nepal, on the way as she was presenting before me on women and business development. 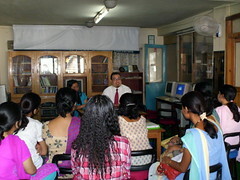 The class is held at SeaGate Computers, a training centre located quite close to the FTG Nepal office. Everyone was very welcoming; the class was a very interesting group of women, some working in IT currently and other planning on moving to IT – and several of the participants have Masters degrees. 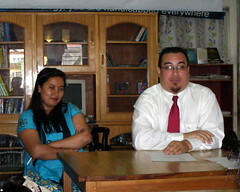 After Nina-ji gave her presentation (in Nepali) it was my turn. I talked about key fundamentals in IT: the elimination of distance, the shift to the digital world and the importance of human connection. I also spent some time sharing the names and specialization of the many women I personally work with at CCS at the University of Guelph. I thought a personal connection to success stories of women in IT would helpful Many thanks to my friends at the U of G library for lending a hand with some research for this presentation – I really appreciate it. change that IT field has brought in the world. Many thanks for sharing things with us. We really enjoyed.